Jose Castillo was born on Thursday, March 19, 1981, in Las Mercedes, Guarico, Venezuela. 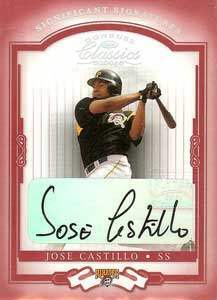 Castillo was 23 years old when he broke into the big leagues on April 7, 2004, with the Pittsburgh Pirates. His biographical data, year-by-year hitting stats, fielding stats, pitching stats (where applicable), career totals, uniform numbers, salary data and miscellaneous items-of-interest are presented by Baseball Almanac on this comprehensive Jose Castillo baseball stats page. José Castillo Rondón was a Major League baseball player for the Pittsburgh Pirates (2004-2007), San Francisco Giants (2008), and Houston Astros (2008). On December 6, 2018, Jose and Luis Valbuena died in a car crash during an attempted robbery. The duo were playing in the Venezuelan Winter League, had just won a game versus the Leones del Caracas, and were traveling from Caracas to Barquisimeto when the crash occurred. Did you know that when Jose Castillo hit fourteen home runs in 2006, it was the most by a Bucs second baseman since Warren Morris hit fifteen dingers in 1999 ? Only two other Pirates second basemen have hit fifteen-or-more home runs in a season, Bill Mazeroski (19 HRs in 1958 & 16 HRs in 1966 ) and George Grantham (18 HRs in 1930 ).